Many owners of older cars are worried that increasing ethanol content in petrol will have corrosive effects on their engine fuel delivery systems and valve seats. 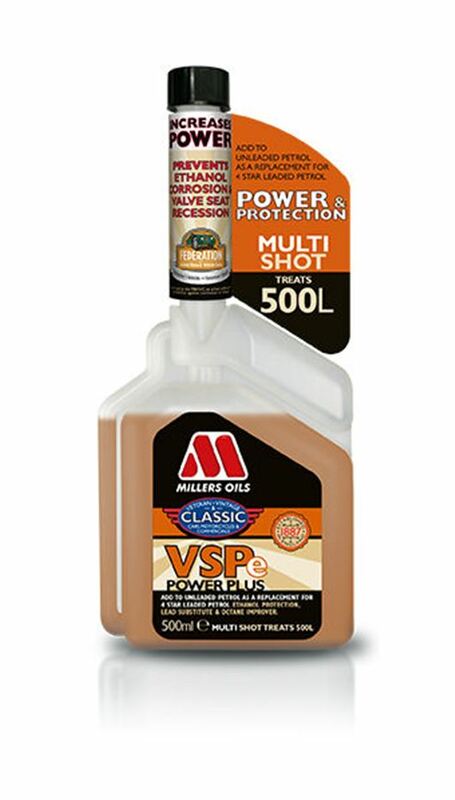 Millers Oils has developed a lead-replacement additive called VSPe Power Plus that prevents valve seat recession, fuel system corrosion and detonation while also providing an octane boost improving the performance of older engines while protecting components from wear and tear. VSPe Power Plus is now available in a 500ml multishot bottle, which makes measuring the 50ml needed to treat a 50l tank of petrol easier, and treats up to ten tankfulls. VSPe Power Plus is one of two Millers Oils additives that have been endorsed by the Federation of British Historic Vehicles Club (FBHVC), receiving an ‘A’ rating for the ethanol corrosion protection the range provides. The rating was awarded following a 12-month evaluation, by the FBHVC, of the durability benefits the range provides to complete fuel systems. The products include EPS, which provides ethanol protection and VSPe Power Plus, which provides ethanol protection, lead replacement and an octane boost of up to 20 points.